More than £1,300 was raised for the LGBT Foundation at a Pride Day held at Uckfield College. Uckfield College students pictured after a Pride event. It was the first LGBTQ+ event to be held at the college and was organised by Edward Peasgood and Tess Oldham. 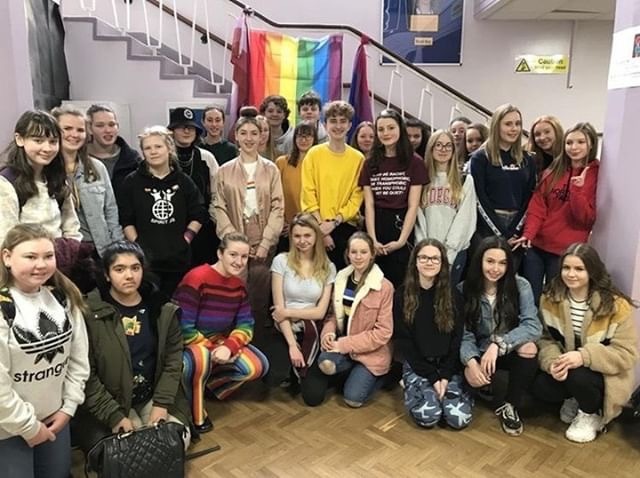 Edward, a member of the East Sussex Youth Cabinet, and deputy youth parliament member for Lewes and Wealden, said it was “an incredible celebration of pride and diversity”. There were lessons about the LGBT community, a whole-school non-uniform day and massive cake sales at break and lunch. • Uckfield College previously donated £365.57 to the LGBT Foundation at the end of 2018 following a carol service at Holy Cross Church. It is to continue working with the LGBT Foundation to support LGBTQ+ students. • The LGBT Foundation provides counselling and campaigning services for LGBTQ+ citizens struggling with identity, discrimation, and coming out issues. It also provides services to encourage gender equality and to support people who are victims of domestic abuse.